I've been hooked on pinterest lately, doing a good deal of exploring and pinning way too many recipes for my poor stomach to handle. The list has multiplied tenfold since last Friday. I've also been busy pinning pretty places and stylish outfits. I just about fell in love when I saw this picture and it stuck in my mind all weekend. Bright poppy red is one of my favorite colors, one that I frequently wear throughout spring and summer. It's such a happy color and is complimentary to my skin throughout it's transition from "what is sunlight?" to lightly tanned. I think it looks lovely on everybody. I love a good, full knee length skirt. I may be an old lady at heart, but I sure am happy to see longer hemlines come back into style. I love everything about this Zara skirt from the color to the pleating. I imagine it floats as you walk. 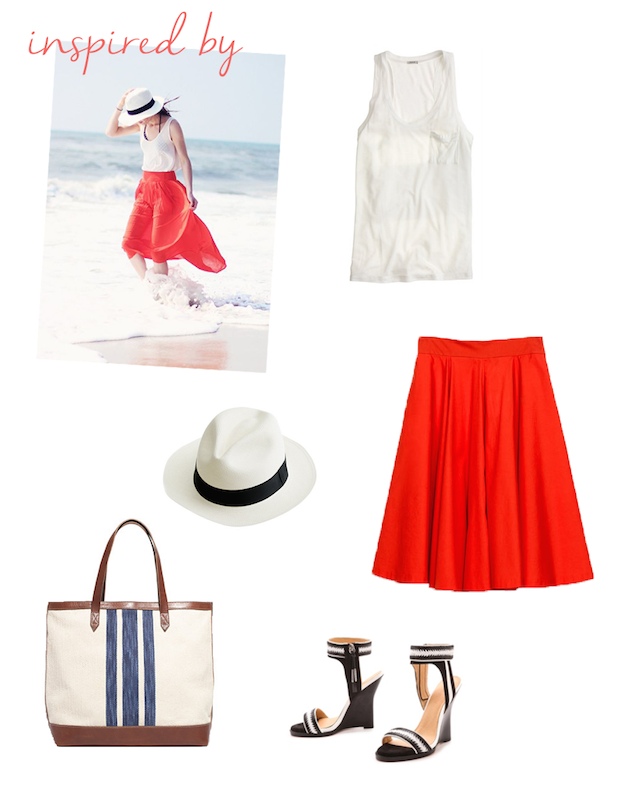 Keeping with the photograph, I chose a simple and loose fitting tank, a clean white panama hat, fun wedges, and a beach bag. This outfit would be perfect for just about any summer activity. It would make a lovely sightseeing ensemble, while also being perfectly appropriate for a stroll on the beach. I also really love the white stitching / details on these L.A.M.B. wedges, I'd wear them with everything! love that picture and the outfit you put together!